In Maps on the iPad mini, three tools can save you from typing the same locations repeatedly. You see these options on the overlay displayed when you tap the word Bookmarks near the upper-left corner of the screen. At the bottom of this overlay, you see three buttons: Bookmarks, Recents, and Contacts. Tap the littleiin a blue circle to the right of the location’s name or description. The Info screen for that location appears. Tap the Add to Bookmarks button. You may have to scroll down the Info screen to see the Add to Bookmarks button. After you add a bookmark, you can recall it at any time. To do so, tap the Bookmarks icon, tap the Bookmarks button at the bottom of the overlay, and then tap the bookmark name to see it on a map. The first things you should bookmark are your home and work addresses and your zip codes. These are things you use all the time with Maps, so you might as well bookmark them now to avoid typing them over and over. 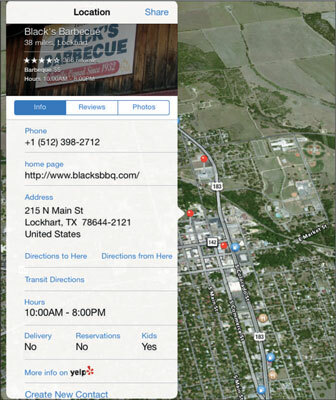 Use zip code bookmarks to find nearby businesses. Choose the zip code bookmark, and then type what you’re looking for, such as 78729 pizza, 60645 gas station, or 90201 Starbucks. Tap the littlei-in-a-circle in the lower-right corner. Tap the Drop a Pin button. A pin drops onscreen, and you see the words Dropped Pin with a little i in a blue circle on the right. Tap and hold on the location you want to mark with a pin. The Dropped Pin overlay appears. You can fill in some details about the pin and take similar actions to those that appear in the Info screen. To move a bookmark up or down in the Bookmarks list: Drag the little icon with three gray bars that appears to the right of the bookmark upward to move the bookmark higher in the list or downward to move the bookmark lower in the list. To delete a bookmark from the Bookmarks list: Tap the – sign in a red circle to the left of the bookmark’s name and then tap the red Delete button. When you’re finished using bookmarks, tap anywhere outside the overlay to return to the map. 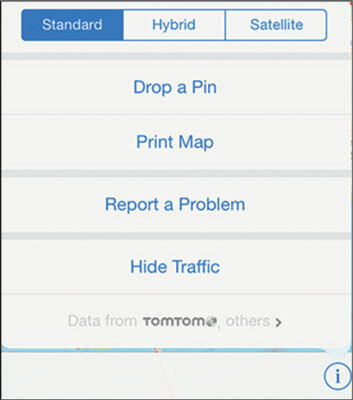 The Maps app automatically remembers locations you’ve searched for and directions you’ve viewed in its Recents list. To see this list, tap the Bookmarks icon, and then tap the Recents button at the bottom of the overlay. To see a recent item on the map, tap the item’s name. To clear the Recents list, tap the Clear button in the upper-left corner of the overlay, and then tap the big red Clear All Recents button at the bottom of the overlay or tap Cancel if you change your mind. When you’re finished using the Recents list, tap anywhere outside the overlay to return to the map. To see a list of your contacts, tap the Bookmarks icon and then tap the Contacts button at the bottom of the overlay. To see a map of a contact’s location, tap the contact’s name in the list. To limit the contacts list to specific groups (assuming that you have some groups in your contacts list), tap the Groups button in the upper-left corner of the overlay and then tap the name of the group. Now only contacts in this group display in the list. When you’re finished using the contacts list, tap the Done button in the upper-right corner of the overlay to return to the map.